Yeah so it somehow happened again: I’ve made it into the finalists of Saveur’s Best Food Blog awards in the Desserts and Baking category!! I am JUST as stunned by this as I was last year (if not more). It’s such a huge deal to me that I’ve even made it this far again and it’s all because of your support. So HUGE thank you to everyone and congrats to all of the other nominees (I am in such good company, you guys). I would, of course, be completely thrilled if you’d vote for me here on Saveur’s Website. Okay onto what we’re all here for: the foooood! 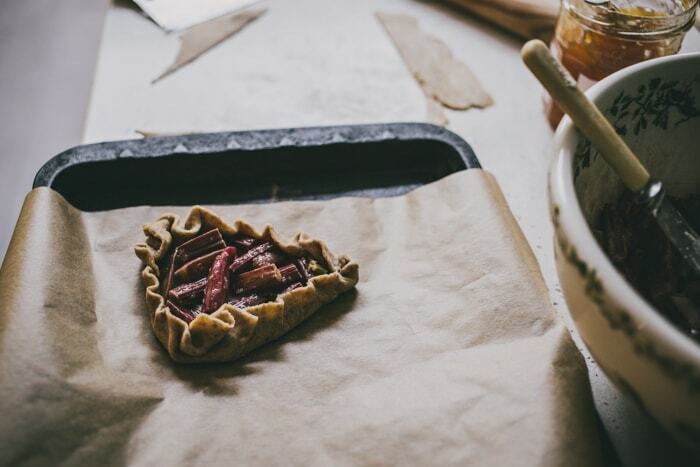 Seems like I have a *thing* for rhubarb pastries. These are slightly different from the last time I shared a rhubarb galette thing: they’re tartlets (mini and cute!) and have a half-rye-flour crust. I also used a different technique for making the pastry called ‘fraisage’ so it’s extra flaky (don’t worry I’ve got step-by-step pics in the recipe so it shouldn’t be too daunting). Oh and they’re funky and triangular. So indie right? Out of the mainstream. Into the deliciously shaped stream, amirite? I feel like the shape affects I flavour somehow, I dunno man. But regardless of the shape, it’s definitely a good shout to make these tartlets now now now. I can literally feel the fact that spring is finally here – no gloves for cycling, the air has that green ozone-y smell all the time and I’m sneezing like a crazy person thanks to all of the pollen floating about. (Fact: London has a lot of Plane Trees. They drop literal pollen bombs everywhere. It has been warmer than I actually expected this weekend which led to me going full on into warm-weather-mode. Frappuccinos + No sleeves + bare legs…I did start to question just how hot it was once I was on the tube and everyone around me was wearing jeans and jackets. Especially because I was wearing a tie dye top and dinosaur earrings so wasn’t exactly ‘inconspicuously dressed’ for West London. But I powered through and managed to get mahself a slight tan, although that may be my wishful thinking. Luckily even if the weather isn’t helping you build up a tan , you can still make tartlets (to be honest, tartlets trump tans any day of the week for me). They’re jammy, flaky and just delightful. If you’re cold, eat em warm with ice cream. If you’re hot – eat them at room temp…still with the ice cream and an extra large glass of iced coffee. 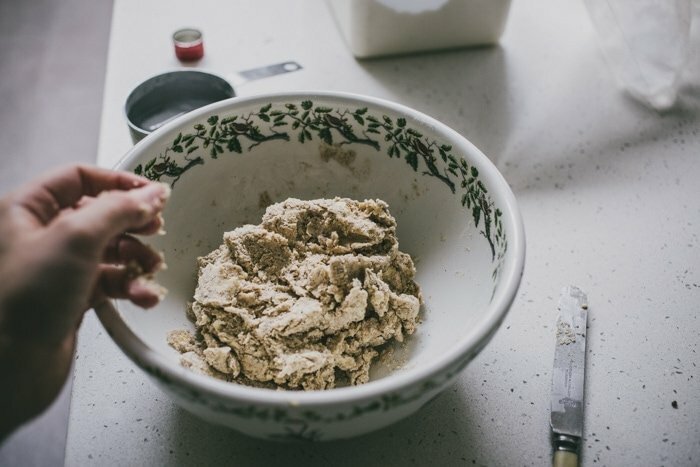 In a large bowl stir together the flours, cinnamon, sugar and salt. 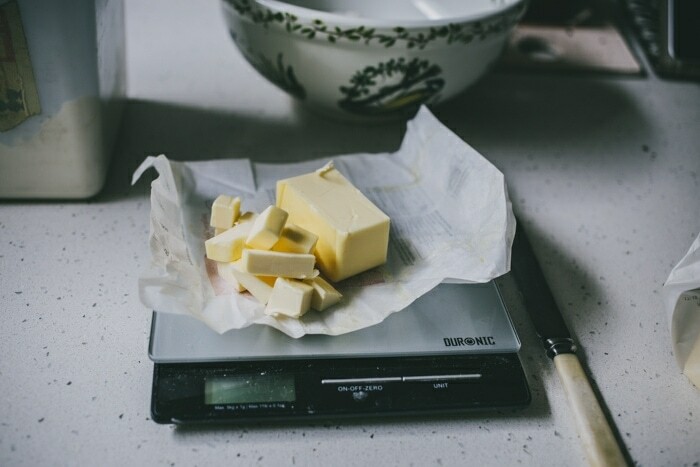 Add the cubed butter and rub into the dry ingredients using your finger tips or a pastry blender. Stop when about half the butter has been rubbed in the rest of the butter is in pea-sized lumps. Drizzle in the tablespoon of vodka. Drizzle in the ice water, 1 tbsp at a time whilst gently tossing the mixture. 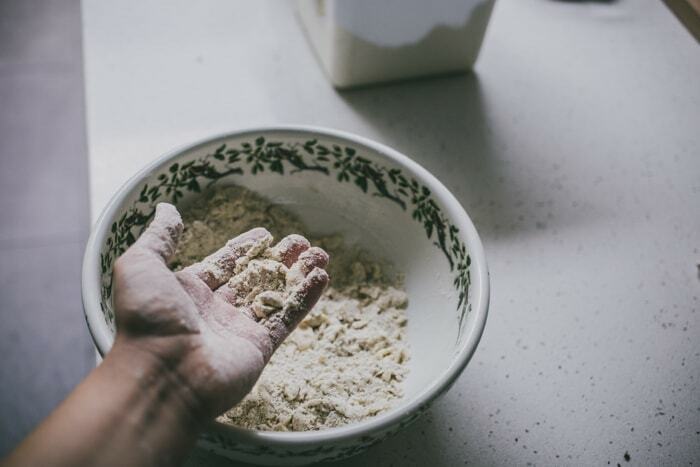 Stop adding water when the mixture holds together when squeezed (you might not use all of the water). Bring it all together into a ball and chill for 15 minutes in the freezer. Now you’re going to use a technique known as fraisage to create flaky layers! 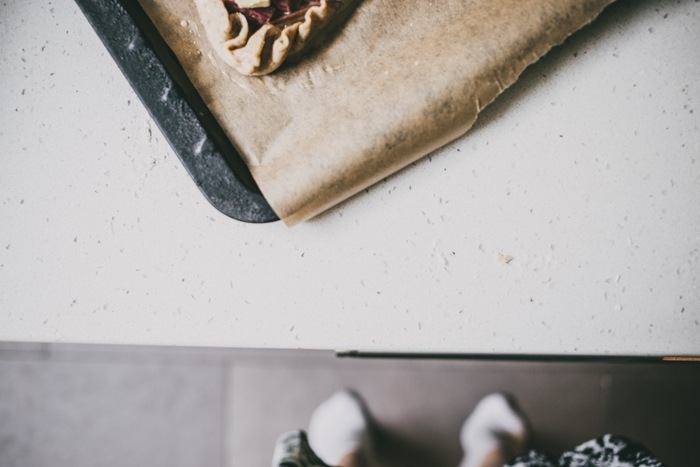 Take chunks of pastry and smear them using the heel of your hand onto a work surface. 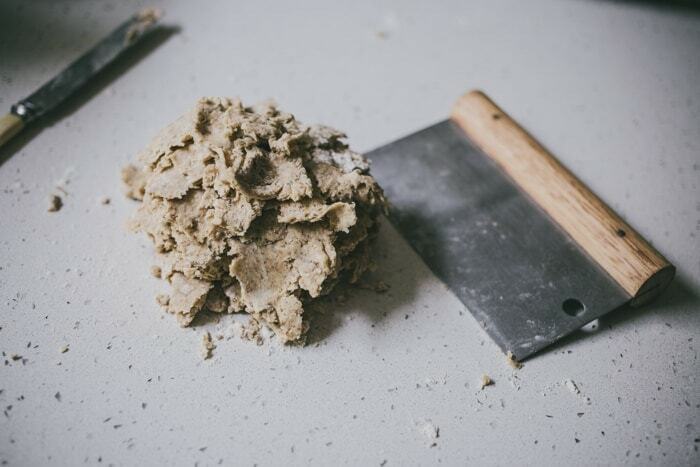 Use a bench scraper, palette knife or butter knife to scrape up the pastry (keeping it as flat as possible) and layer the smeared sheets on top of each other to create one pile of layers of pastry. Repeat this with all of the pastry. Form into a circle. Flatten slightly with you hands and wrap the pastry up in plastic wrap. Chill for 30 minutes. 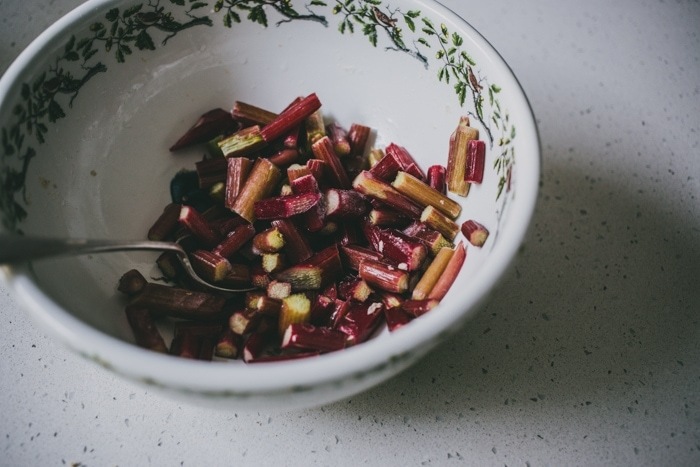 Place the chopped rhubarb in a large bowl with the sugar, orange juice, flour and salt. Set aside. Preheat the oven to 350 F (180 C). 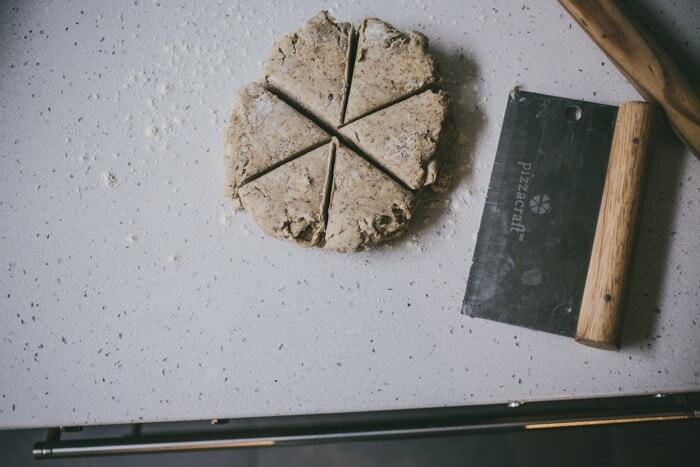 Unwrap the disk of pastry and cut into 6 wedges using a bench scraper or sharp knife. 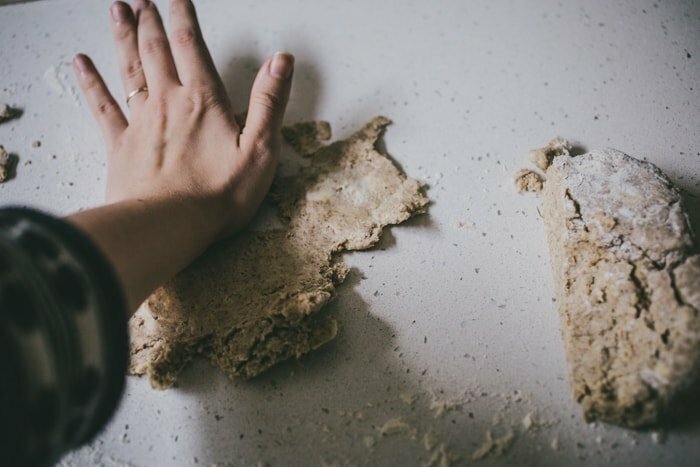 Roll one wedge of dough out on a lightly floured surface until it’s about 1/8-inch thick, trim the edges so you have a triangle of dough. Spread a little bit of apricot jam into the center of the triangle of dough and spoon on a couple of tablespoons of rhubarb filling. Gather the edges of the pastry up towards the filling, folding and pressing the pastry so that it pleats. Transfer with a bench scraper to a lined baking tray. Repeat with the rest of the pastry wedges. Brush the pastry with beaten egg and sprinkle with cane sugar. 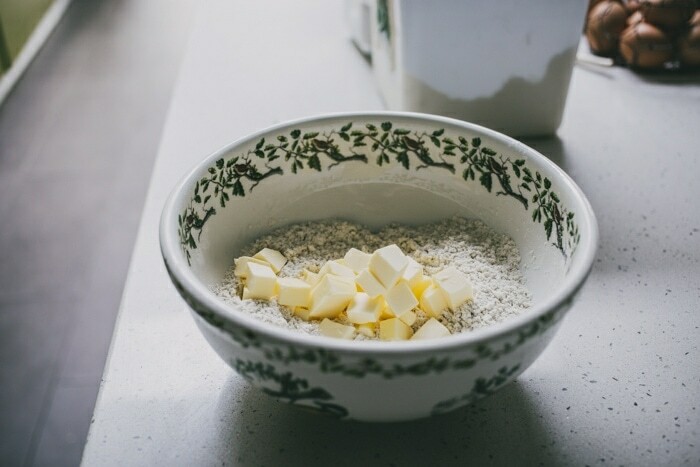 Dot each tartlet with a little bit of butter. Congratulations on the nomination, that’s such a huge honor, and you totally deserve it! 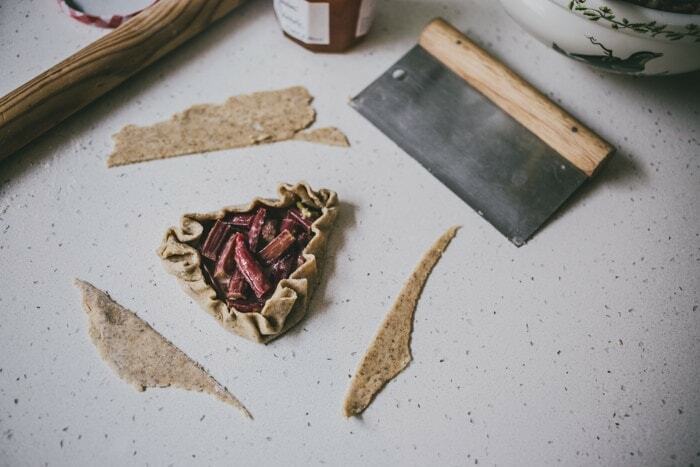 We’re on the same rhubarb page today, I’m obsessed with it right now, and your rye crust sounds so unusual. High fives and confetti emojis and congrats on the nomination, girlfren! Now please mail me eleventy billion of these tartlet beauties. So happy for your nomination! I voted for you boo. And these tartlets!? Unreal. Saw this recipe. Love rhubarb. Hit the market. Bought the rhubarb. Bought the rye flour (I was out). Made these up just now. Neighbors smelled them. Came over from across the street. These tartlets, Sambuca, sunshine (rare) and neighborliness. Great, great afternoon. We are in your debt here on Whidbey Island. Wow that was speedy! So glad you and your neighbors liked them. Congrats on the nomination! You totally deserve it!! I can’t wait to try this rhubarb recipe. I tried your single serving pretzel the other day and it was AWESOME hehe. Triangle tarts! I dig this, because I want my pastry to be edgy and cool. Also, I hope you win. LUV YA WORK! Congrats!! So exited for you and you totally deserve it!! These gorgeous!! Just made two new rhubard things and I am in love! 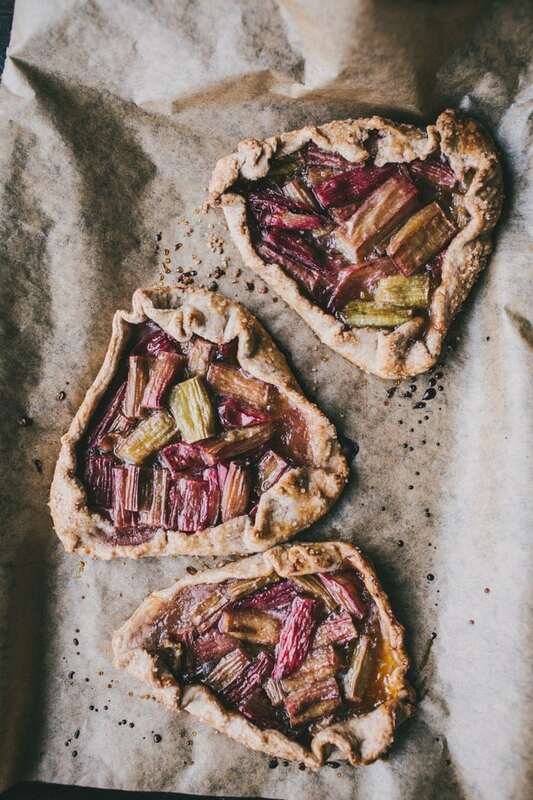 Congrats on the nomination, I really hope you win:) I love rhubarb, and the rye pastry sounds interesting, I might try! 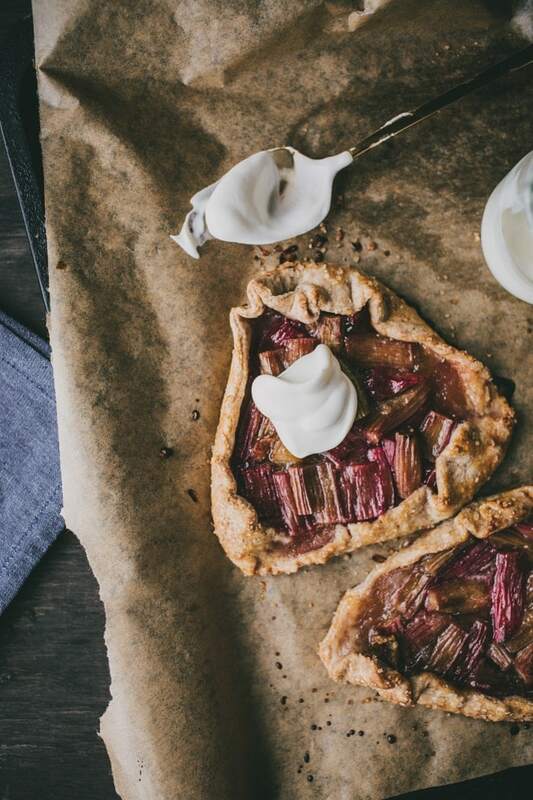 Have some rhubarb in the fridge, your recipe came in a right moment!! 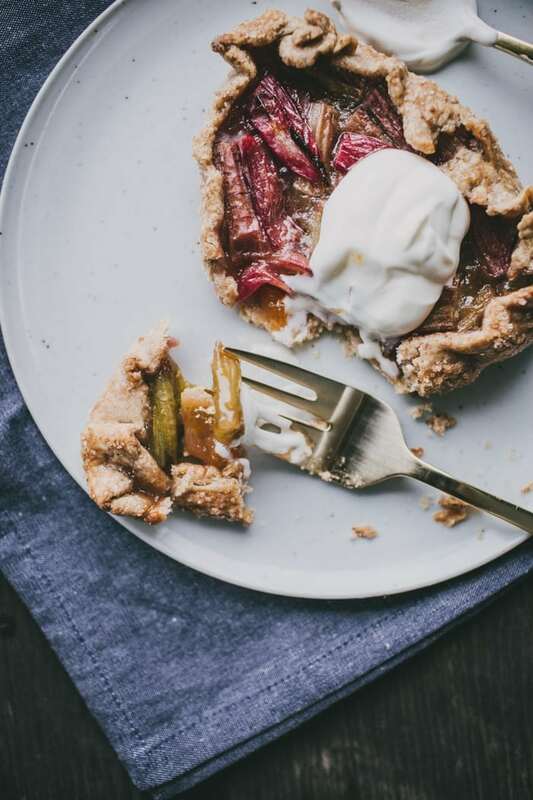 YES to rhubarb. Brings me right back to my childhood when we picked wild rhubarb and dipped it in sugar. Love what you’ve done with it here. Ahh I’ve eaten it like that before, so good. Thanks Maryea! the jammy goodness is RIGHT! 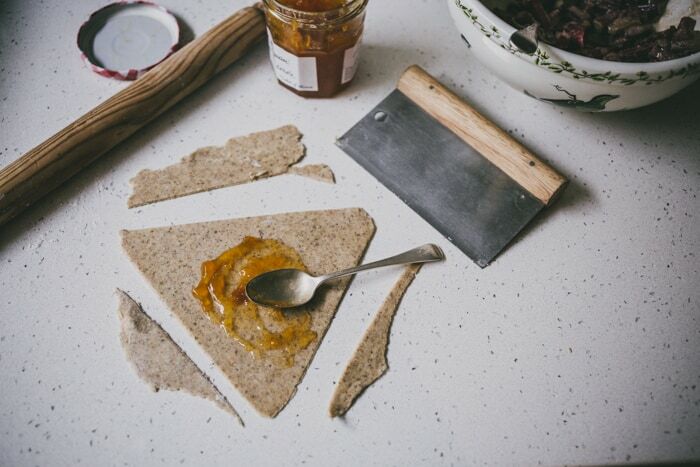 How interesting to make the crust with half-rye flour! Love that idea. I bet it really stands up to the rhubarb. Such cute pieces, too! Love these tartlets.. really feelin that rye crust. 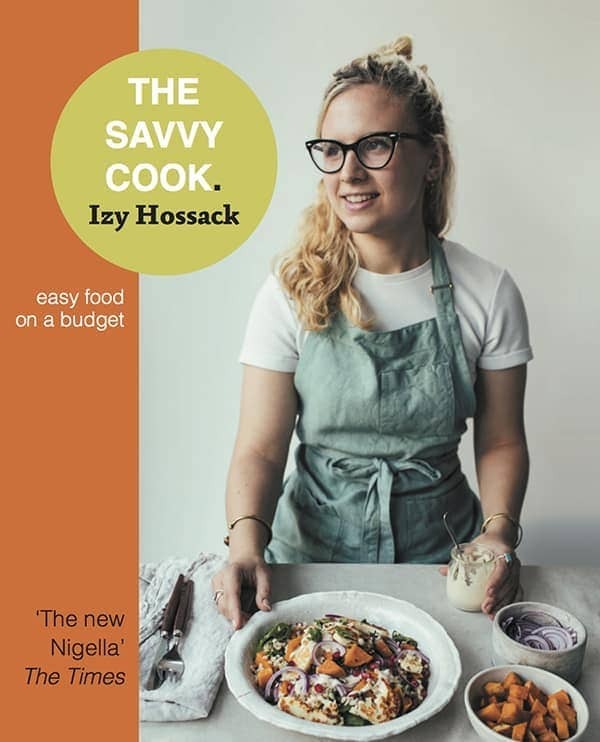 and Congrats gurlfriend..you totes deserve it.. hugs and kissy-face emojis to you..
Izy, you are just a gorgeous human being who makes gorgeous pastry. Yay on the nomination! You deserve it!!! Congrats on your nomination, Izy! I’m off to vote for you, toute suite! And these tartlets are gorgeous! Congrats on your nomination! 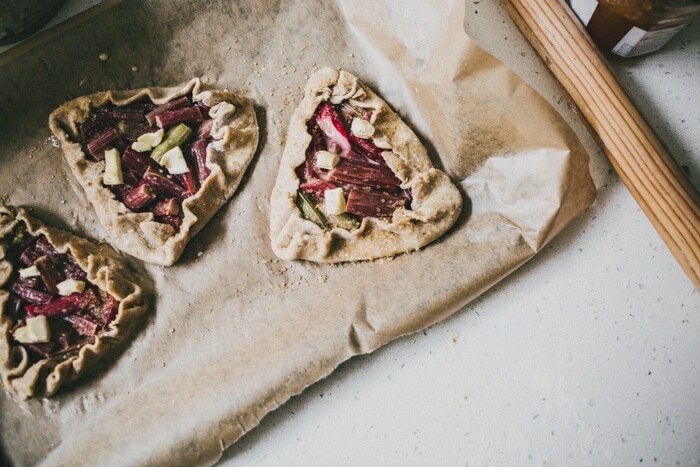 Your rhubarb tartlets look delicious! Lovely dessert! This kind of tartlets are the ones that make you feel like home and scream ‘homemade cuteness’. Hehe. They look so good! Aww thank you so much Gemma! ahhhh Izzy you made my day! I seriously just yesterday thought about what to do with all that rhubarb in my freezer 😀 this is on the spot what I needed! 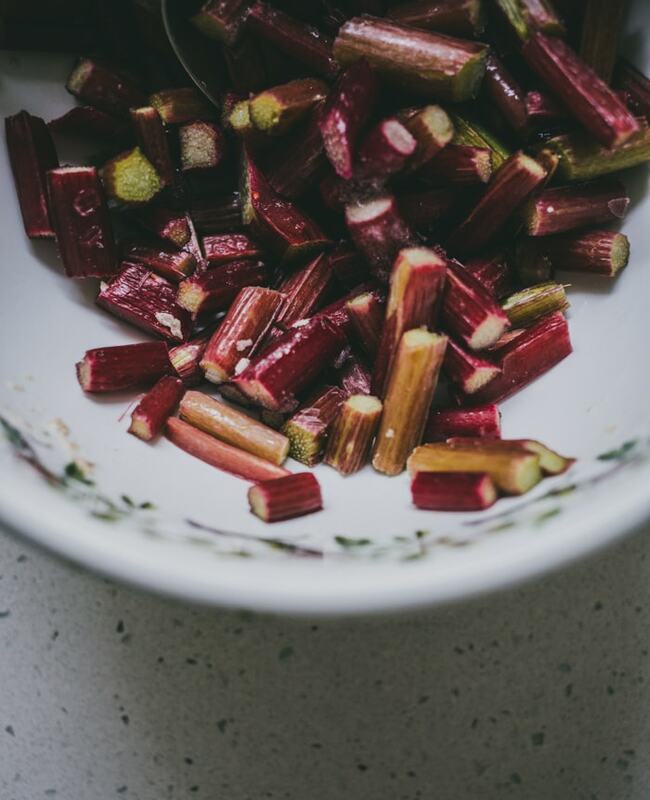 wishing you luck on the blog awards…..
hahah yeah it can be a problem to come up with recipes for rhubarb! Congratulations!! Your totally deserve it – your blog is AMAZEBALLS! Ps. The tartlets looks scrumpcious! Congratulations, that is awesome! Of course I will vote for you!!! Why do you put the apricot jam on? Is it so that the crust should not get soggy? I got fed up with waiting for rhubarb to get here, so I took out the rhubarb that I froze last spring and it is currently in a pie in the oven with some blueberries that I also froze last summer. If spring won’t come to me, I’m coming to spring. I absolutely LOVE your blog!!! So naturally, I would vote for you! I have never used rhubarb. I didn’t even know it existed. I can’t wait to try this out though. It looks delicious! Huge congrats on the Saveur nomination!!!!! You deserve it. Your photos and recipes are so inspiring. Rhubarb is my jam, btw. My husband would marry me all over again if I made him this! He loves all things rhubarb! And a tart? Forget about it! Marry.me.again!